Harpreet Sood from NHS England and Sarah Wilkinson from NHS Digital taking questions after her keynote. New health and social care secretary Matt Hancock has promised that “interoperable data standards” will finally deliver integrated health and care IT systems. Yet standards are not new, and they are not the only thing that will be needed, the UK Health Show heard. Lyn Whitfield reports. The idea that healthcare IT systems should use standards to exchange information with each other is hardly new. But it has been embraced with enthusiasm by Matt Hancock. 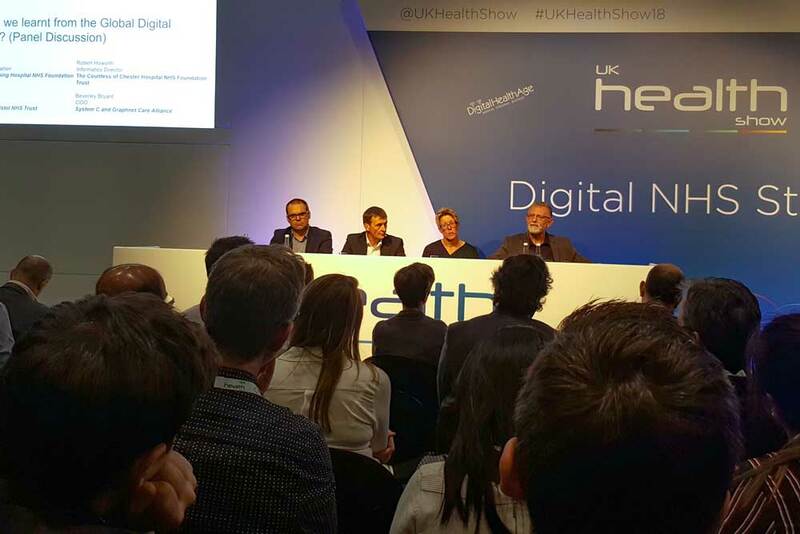 At this year’s UK Health Show, NHS Digital chief executive Sarah Wilkinson said that even more than his predecessor, Jeremy Hunt, Hancock “gets” the standards agenda. “He has made it his mission to migrate towards standards and over the next few weeks we will be providing guidance on the standards critical to the system,” she said. Of course, NHS Digital is not going to be able to rustle up a whole new suite of standards “over the next few weeks.” Instead, it’s a fair bet that it’s going to be re-issuing standards that already exist and, perhaps, giving more of a “launch” to existing pieces of work than it might otherwise have done. The Care Connect FHIR APIs that NHS Digital was commissioned to develop with INTEROPen back in 2016 look like a good candidate for a latter approach. Two years of effort has already gone into this project to link clinical pathways with FHIR resources and to provide interfaces that enable “point to point” transfer of data between systems. And, handily, the APIs were slated to be in use by the end of the year. Against this background, a debate on the second day of the UK Health Show focused less on what standards might be launched than on the status of what is in the pipeline. Beverley Bryant, a former NHS England and NHS Digital executive who now works for the System C & Graphnet Care Alliance, suggested more dialogue between the centre and suppliers was needed as standards were developed. “Yesterday, Sarah Wilkinson put the challenge out there to ‘just use standards and get on with it’,” she said. “And when it was suggested to her that some of the standards are not clear, she just said ‘nonsense’. “Sometimes, something only works when it is implemented,” he said. “Bristol has shown the Care Connect FHIR APIs can be used, so there is nothing to stop other people doing the same. As the exchange implied, the willingness – or otherwise – of suppliers to use the standards that exist, and to enable their systems to exchange data with others, has become something of a sore point in discussions about interoperability. In a Q&A at the end of her presentation, Wilkinson suggested that a lot could be achieved through the procurement route. “The fact that the vendor community uses its own standards is one of the challenges,” she said. She suggested that the renegotiation of the GP Systems of Choice contract, which was supposed to make big suppliers open their APIs to smaller ones, but which failed to do so, was finally leading to a “mind-shift” among primary care vendors. However, slow progress on open APIs and standards adoption isn’t all down to suppliers. NHS organisations have to be willing to adopt new systems and working practices. As another member of Wilkinson’s audience pointed out, GPs have been digital for a long time, and it would take a lot for them to go through the “utterly traumatic” process of migrating their data into a new system and then getting to grips with it. Meanwhile, much of her keynote speech had been devoted to the need for NHS organisations to start using the Professional Record Standards Body’s standards for structuring records and letters, and the SNOMED CT standard for coding the clinical information they contain. On the GP front, Wilkinson said NHS Digital is developed sandboxes “so people can see what their data might look like in another system”, to support a “functioning market for GP practices.” On the SNOMED CT front, she could only urge organisations and their staff to focus on the benefits. Within the “everything else”, he added, payment systems that discourage the kind of integrated working that interoperable systems are supposed to support should be included. A Canadian observer, Dr Alexandra Greenhill, founder of the Careteam digital health platform, agreed with this. “The problem is there is no conductor,” she said. “Politicians, the press, they think the NHS is one system, but like the health service in Canada it is a lot of systems.” Interoperability is being asked to link them up; but the disparate elements all have to sign up to doing it. Both she and Singh argued that rather than trying to “do interoperability” the health and care system would be better to work out when it really needed to exchange information and find the optimal way of doing that in each instance. “You have to do this in steps, and in response to real needs,” Singh contended. This would also help suppliers. “We do not just need to demand standards, we need to get them adopted,” David Hancock reiterated. The message from UK Health Show was that HL7 FHIR has fundamentally changed the terms of the interoperability debate, and that NHS/industry collaborations like the Care Connect FHIR API programme are making more rapid progress than might have been expected even a couple of years ago. But “interoperable data standards” will not be enough. The way health and care are organised and funded, procurement rules, leadership, engagement, and usability also contribute to an environment in which staff instinctively turn to technology – or to paper and fax. Matt Hancock is not the first health and social care secretary to notice that NHS IT has a problem with getting systems to “talk to each other.” And he’s not the first to advocate standards as the answer. Fail to address the wider issues, and he won’t be the last.